You are at:Home»Health and fitness»What if your body felt vibrant? While Langley’s fat golden bunnies huddle outside in the winter sun, nine humans make their way to the Island Fairgrounds to warm up at Vibrant Fitness. Housed in the Agricultural Exhibits building, the long whitewashed workout room hums with good juju and hard working bodies. Working out to prevent getting hunchy or losing one’s backside to gravity, Fawcett is passionate about maintaining the body’s functionality and core strength. 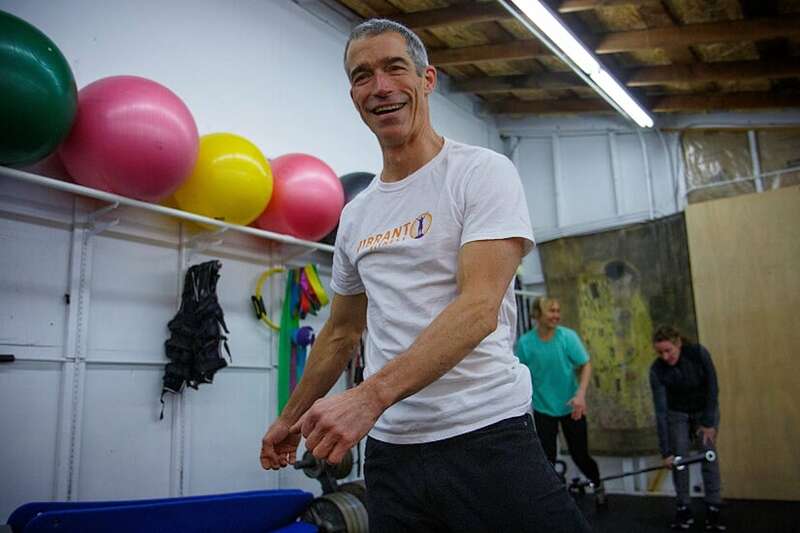 He has refined the practice of functional strength workouts for nearly a decade and has spent the last four years training others at the fairgrounds site. 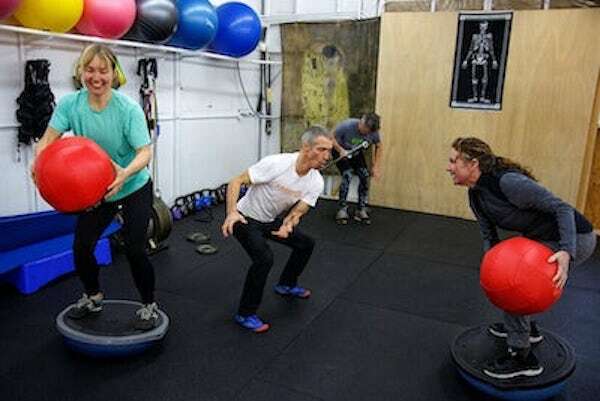 Emi Gunn, left, and Marybeth Shirley have a laugh with Fawcett while balancing and twisting on half-circle workout balls. Brian Palmer learns good form while lifting weights. Sometimes working in pairs, sometimes singly, men and women turned, lifted, shook and bent to workout music in 60-second intervals with 20 second rest periods in between. At a corner exercise station, Brian Palmer, a retired heavy equipment operator, lifted weights suspended from a long pole. Observing the effort it took him, the minute-long exercise looked like hard work. Vibrant himself, Fawcett runs back and forth, checking on his peeps, and with good humor, models how to rotate and hold one’s body to prevent injury and maximize strength and flexibility. Acupuncturist Tim Batiste says his days are better when he work out. Daughter Yarrow accompanies him. 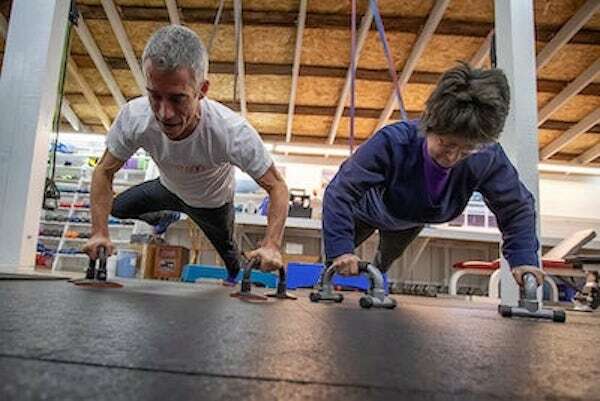 Working out twice a week, sometimes with his 11-year-old daughter Yarrow, Tim Batiste, a Langley acupuncture practitioner, said he’s been coming in for years. “I have a better day when I work out here,” he said. “It maintains my strength and flexibility. Workout schedules at Vibrant Fitness total fifteen times a week. Also leading small group training sessions are: Kate Calderwood, CES(Certified Corrective Exercise Specialist); George Burris, core and running specialist; and Alex Pearl, youth training specialist .Next week’s schedule is posted here. Fawcett packs the gym’s workout gear away for just three weeks each July during the Island County Fair, when exhibitors show their handiwork with grains, grasses and vegetables. Then he takes his training to the beach. Besides workouts and personal training at the fairgrounds site, Fawcett has provided industrial athlete training to employees at Nichols Brothers Boat Builders in Freeland for the past five years and consults with other organizations as well. “We’ve been able to reduce sprain and strain injuries by over 50 percent,” Fawcett said. A shot from 2015 with Fawcett meeting with Hearts + Hammers volunteers before they head out for a day of making repairs for local community. “ I do what I do because I consistently see the profound positive impact it has on people. And because it makes me feel alive,” Fawcett said. Check out cultivating your own vibrancy at Vibrant Fitness. Adam’s also excellent in his “trauma-informed” awareness and readily adapts routines easily. He’s the epitome of “Mr. Response Flexibility”! 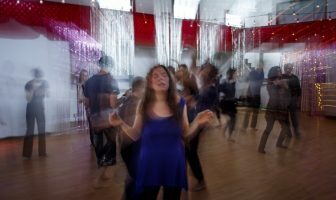 Trauma-informed? Haven’t heard that term before. True dat! 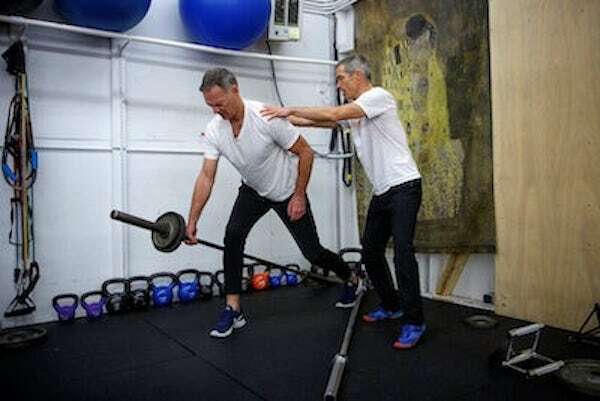 I’ve been working out with Adam for several years and his workouts are not only fun socially, they help me stay fit, strong and able to do the things I love — from ranch work to mountain biking, from lifting my baby nephew to sitting and talking with clients. He has helped me adapt the exercises to accommodate a long term back injury and has been an integral part of helping me heal my back. One of his best attributes is that he knows when I need to be pushed and when to back off and support me in not over doing it. Adam is pure passion and enthusiasm embodied. Thanks, John! I like that you write about his knowing you well enough to push and pull at the right times. He’s one of a kind, Adam. I was sorry to miss being at Vibrant Fitness when you did this story (I’m enjoying time in Hawaii). Adam has been my trainer for about 7 years. I was an athlete in high school (many years ago!) so training is not foreign to me. However, as a 60-something woman, I really find the precision and flexibility of Adam’s training very helpful. He is also an incredible motivator. I would encourage anyone to get in touch with Adam….best trainer I’ve ever had! 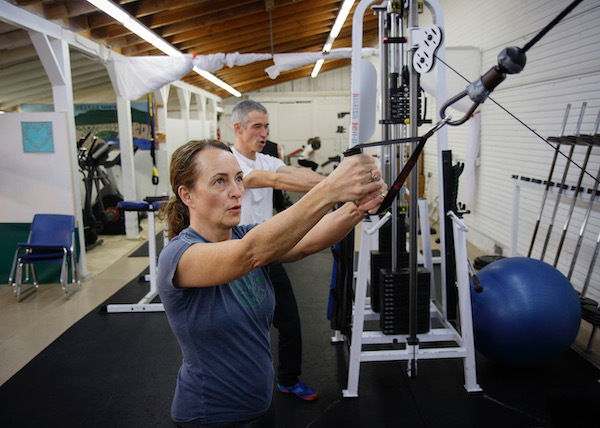 Your story did a great job of capturing the essence of workouts at Vibrant Fitness. Thanks. Hi Karen, Glad for your comments! We loved Adam’s energy and fun way of coaching folks into knowing and improving their bodies.